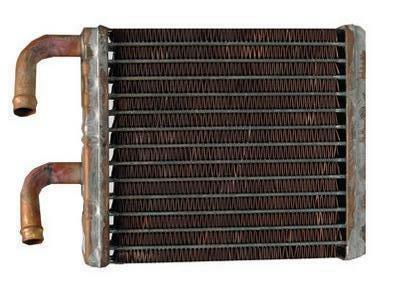 The standard heater core above is copper – some cores are aluminum . 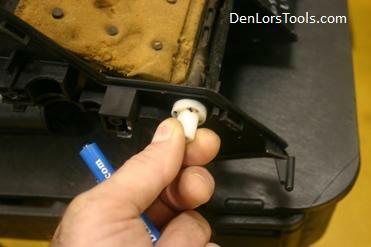 © DenLorsTools.com Summary: This is part two of our exclusive car repair blog helping to troubleshoot car heater problems when they blow cold. The original article has been very popular in the colder months of the year. This repair article picks up where the first article leaves off. If you have not read the first part of the Car Heater Blows Cold article, I recommend reading it first. One common complaint with the car heater performance; is the temperature of the air only blows warm for a few seconds and then starts to blow cold. This could be caused by a restricted heater core or a thermostat that is staying open – or the t-stat is opening too soon. 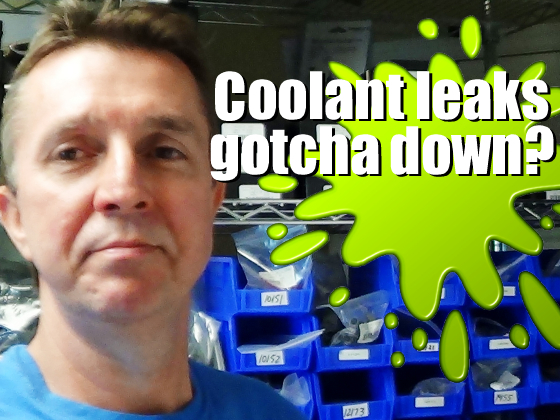 If the heater core is clogged up, the coolant in it may be hot initially. 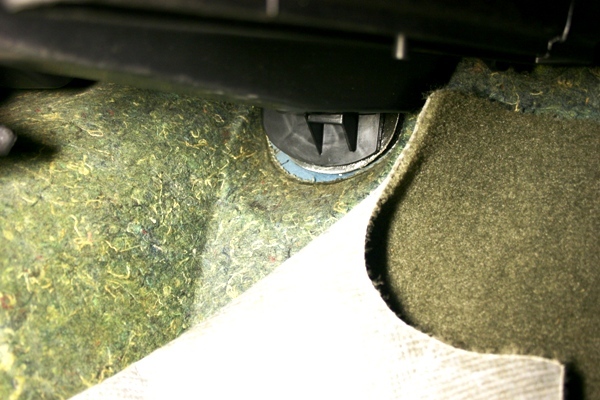 However, after the air blows through the heater core it lowers the temperature of the coolant inside of it. If the flow is restricted it will cool the coolant down to a point that results in the air blowing through the fins to NOT be heated as designed. Low coolant flow within the core can sometimes be deceiving because both heater hoses may feel hot to the touch. As talked about in part one of this article, one test is to check the temp of both hoses to see if they are both hot to the touch. If the core is completely stopped up, one hose will be cold. The possible curve ball to this test is that there may be enough flow to make the hoses feel hot to the touch, but not enough flow to maintain a high enough temperature when the heater is being operated. This may result in warm air blowing through the vents only for a few seconds. The easiest way to check for volume of flow is by removing both heater hoses and spraying water through the core with a garden hose. If only a trickle comes out, then a restricted core is confirmed. There should be free flowing water exiting the core when this is being done. Just as much water coming out as being sprayed in. Sometimes the heater core can be flushed to increase flow and other times the core has to be replaced. If the thermostat stays open all the time, or opens too early (before the engine reaches the target operating temperature) the heater will not blow as warm as it should. If this is the case, usually after the car has ran awhile the vent temperature will increase gradually (at varying rates depending on the ambient temp). If it’s really cold outside the engine’s temperature gauge may stay on cold. If the engine’s temp never reaches 1/2 way or the normal range, the heater cannot be expected to heat up either since it operates by exchanging heat from the engine’s coolant. This is why warm air may blow for a few seconds when first turned on, but after the core is cooled off, cold air will come out of the vents. Also, many times if the thermostat is not closing correctly, a CEL (Check Engine Light) will be turned on with a fault code stored. 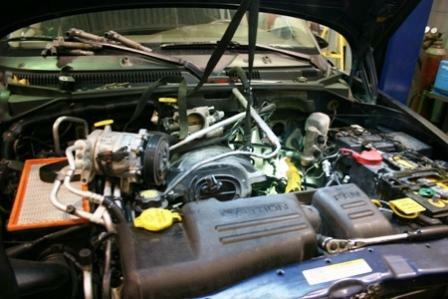 The code that can be set is a P1281, see the articles below for tips on dealing with this code on the Jeep Grand Cherokee and the Chevrolet Trailblazer. Heater blows warm a little when RPMs are raised? A common occurrence is the heat blows warm or “warmer” when the gas pedal is pressed slightly. When the engine is turning faster (higher RPMs) the water pump turns faster too. When the waterpump is pumping water faster there’s more water volume traveling through the heater core. A little increase in temp is normal. Extreme differences are felt when the system isn’t working as it is suppose to. As mentioned in part one of this article, air trapped in the cooling system can affect the heater performance. Bleeding the air out is the first thing to try in this case. What if the air is bled out, the heater core is not restricted, the thermostat is new, there’s not an actuator or door issue and there’s not much heat blowing out the vents? Next thing to investigate is the water pump. Sometimes though it is seldom; the water pump may not be pumping sufficiently. The water pump impeller may have rusted fins on the impeller. 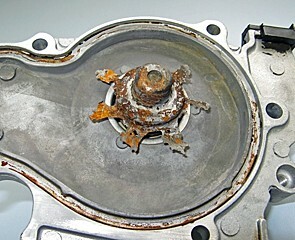 A special thanks to workshop.search-autoparts.com for providing the image of the rusty water pump. In the summer this pump would cause an overheat – in the winter it would cause the heater performance to suffer. One way to check for a problem like this is to do the following. Measure three temperature readings from the car with an infrared thermometer. 1. Radiator temperature. 2. Engine block. 3. The vent temp with the heater on maximum. The three temperature readings could indicate that the water is not flowing properly. A cold vent temp with a “warm” engine and a cool reading at the radiator is the main indicator. 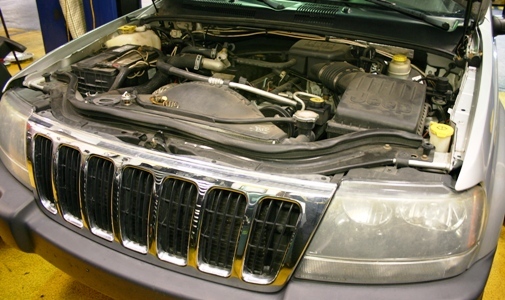 A more direct way to check flow from the water pump is to remove the upper radiator hose from the radiator. Have someone start the engine for a few seconds to see if there is water pumping out. The impeller on the water pump could come loose or can deteriorate from rust or electrolysis due to lack of maintenance or improper ground straps. Still would like more tips? See Car Heater Not Working? Troubleshooting, How to Fix Repair Tips. What about the car heater that plugs into the cigarette lighter? There are several brands of these available on the Internet that provide the hope of a cheap fix for a malfunctioning car heater. Nice thought, but just like most things in life that sounds too good to be true it usually is, this one is too good to be true also. The heating element is very small and inadequate for making a real difference in the passenger compartment temperature. The fan doesn’t put much volume out and if it did, the air would not heat up even as much as it does. There are several models that have a slightly larger size, the problem is with those units they usually end up blowing a fuse. Larger fuse anyone? Not a good idea, this might melt wiring in the car and could likely be a fire hazard. There have even been some reports of these units melting! Save yourself the trouble and expense and work towards fixing the heater system your car came with. Click the following for even more on car heater not working, with tips for troubleshooting problems. I have a 95 lincoln mark viii. Replaced Radiator, water pump. I did a flush of the heater core yesterday and water flowed freely through the core (I did the reverse flush as recommended). Re attaching hoses and starting vehicle I touched the inlet line and it was hot. The outlet line even after running the engine, never gets ‘Hot’. Air in vehicle never gets hot. Is there a possible restriction somewhere in the line of coolant flowing AFTER it leaves the core? Is there a possible restriction after the coolant leaves the core preventing normal flow? Sounds like air trapped. I’d try the Airlift System. Good Luck. Thank you for your response unfortunately I do not own an air compressor..
Is there an electric version of the tool you suggested? No. Perhaps a repair shop is needed. Good Luck. I have a Chrysler 300 3.5 with no heat I changed the thermostat and blew out the heater coil still no heat? Hi Dennis. Thanks afor all the great troubleshooting tips. I am having a similar problem. I have a 2000 Mitsubishi Mirage. The check engine light has been coming on intermittantly for about a week. Yesterday it overheated. When i took the radiator cap off it came apart in 3 pieces. I filled it to make it home and got a new cap. It did not overheat after that but it did not get more than halfway warm and heater only blows cold air. Thermostat? I’d check both hoses to see if both are hot. If not could be air in the system. If both are hot there could still be a door issue. Good Luck. Hi Dennis, My wife drives a 2008 Jeep Liberty. She has had heating problems in the last year. Initially the temperature was not getting high, so I topped off the coolant and forward and reverse flushed the core. This gave me heat for about a week. I finally brought it to a garage and they did an ammonia flush and replaced coolant (he said core and gauges were fine)…this lasted for about 3 days. He then suggested I switch hoses – which I did, and then we had heat for about 2 weeks. Now I just switch hoses each time the heat slows down and it is a guess how long the heat will last…sometimes a few days, sometimes a few weeks – but my wife is fed up and wants a solution… any ideas? Thanks in advance. The heater core is likely partially restricted. I’ve seen some that seemed to have enough volume when flushing but still would not transfer heat sufficiently. A heater core may be needed to fix it more long term. Good Luck. I have a 2005 Chrysler seabring, it was throwing cold air so I replaced the termastat and it’s still throwing out cold air any suggestions what it could be ??? Sorry not much to base a judgement. But common causes are low coolant, air in the system, HVAC door issue etc. See the article for other possibilities. Ok thanks. Ps the hose are both hot so it’s not the hoses. If both heater hoses are hot then, it could be a door issue or the inside of the heater core coated preventing good heat transfer. I’d try to move the blend door manually to test by finding the actuator that controls the door (if accessible) and remove it so the door can be moved by hand. Put in a new thermostat and it’s still blowing cold air. How about flushing the heater core? Would I have to do that? Before I put the new thermostat in, it was blowing very little heat only when the car was be driven. I’d feel the hoses for the heater core. It may be partially stopped up or there could be air in the system or you could have a door issue. Good Luck. I have a 2001 Jeep Grand Cherokee larado. This is a spare car so when it started overheating and coolant was leaking everywhere I parked it and waited until after the holidays to have it fixed. We first tried a new thermostat and that didn’t fix it. My mechanic put in a new radiator first and we discovered that the water pump was also bad. He replaced that. Then I found the coolant leaking so he replaced and tightened up two hoses. That seemed to stop the leaks but I still have cold air blowing for heat. The temp gauge never goes above a 1/4 of the way. Not sure what that number would be, but it used to hold just below the 210 mark or half way when hot. I’m really hoping this is a simple fix, and quick. It’s really cold here and I can’t drive this without heat. Could be either. Check low coolant. 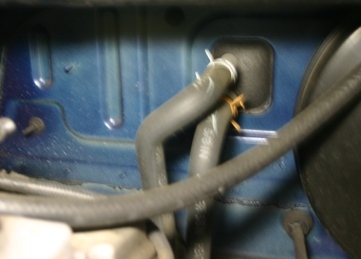 Check both heater hoses to see if both are hot. Usually the thermostat will set a code if operating temperature is not reached within an expected amount of time. Good Luck. Operating temperature should be around 210-212 degrees (around 1/2 way on gauge). The thermostat could be opening too soon. The heater core could also be plugged up some even with both hoses warm but first I’d try to get the operating temp where it should be and recheck. Good Luck. Ok the coolant is full and the hoses aren’t hot hot where I can’t touch them but both are warm so what could it be?? I have provided as much info in my 2 part car heater articles, including my responses to comments as I can without checking cars in person. My responses to comments have become redundant for our readers answering similar questions repeatedly. In fact it’s likely just about everyone’s questions have been covered previously. If unable to diagnose your heater problem it may be time to get help from a technician in your area. FYI – We don’t offer phone support for troubleshooting heater issues. In order to better serve our customer’s, our toll free phone numbers are only for placing tool orders. Thanks to everyone who has helped make this article a success!